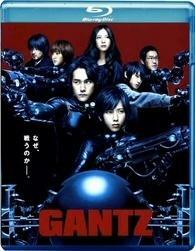 'Gantz' Announced for Blu-ray... and HD DVD??! The live-action adaptation of the Japanese anime looks to be available in a combo pack (which seems to include a disc from the defunct format) this August! In an early announcement to retailers, Warner Brothers says 'Gantz' will have a Blu-ray release on August 30. The story follows two teens who try to rescue a man on the subway tracks and wake up in a room dominated by a mysterious black sphere that sends them to hunt down and kill aliens hiding on Earth. The release will apparently be a three disc set (Blu-ray/HD DVD/DVD) with 1080p video, Dolby Digital 5.1 soundtracks in English and Japanese, and supplements will include interviews and a trailer. You can find the latest specs for 'Gantz' linked from our Blu-ray Release Schedule, where it's indexed under August 30.